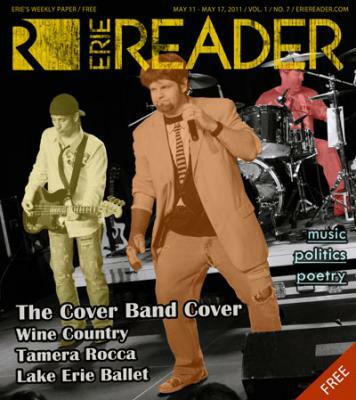 Brilliant writer/ complete hack Cory Vaillancourt set out to see what drives two of Erie's biggest cover bands. A few Daves and a couple Titos later, he had a pretty good sense of the driving force. Erie is often thought of as what it is not rather than what it is. It is not Big; it is not sophisticated; it is not cultured. Stopping to reflect on these oft-cited shortcomings, it's easy to see how clichéd and untrue they are when being used by those who would look backward and not forward. For those who have lived in any sprawling megalopolis, Erie is just big enough. The elegance and timelessness of many of her classic structures exhibit a refined, middle-western sophistication rare amongst the gleaming glass cubes that came after. People are friendly. Culinary delights abound. The thriving art scene continues to produce interesting and engaging work of all types, and the local music scene offers endless variety, from classical to blues, jazz to folk, rock to funk to hip-hop. Any regular at one of Erie's live music venues knows one thing Erie is: it is a great town for live music. Erie's even got its own rock stars. There's at least one playing almost every night, somewhere across town. Their names are recognizable to most passersby on signs outside of bars, benefits, casinos, or banquet halls. They're the guys (and gals) living the rock star life, making lots of money, getting all the gals (or guys), partying late into the night, and sleeping until dinnertime. Erie may be many things, but sometimes, it is helpful to think of Erie as what it is not. It is not a city driven so much by what it is, but rather who it is. Most people who live here do so because they want to, not because they have to. They live here because they love living here, and that sentiment is reflected in every facet of this community, even in restaurants, in bars, in galleries, and in the buildings that house them. This separates Erie from cities that more closely resemble Hollywood. And it is obvious to most by now that Erie is not Hollywood. That reality rock star rehab rehash really does not exist here (therefore, Erie should be glad it is not Big). Erie's rock stars do not stay out all night, every night. Erie's rock stars do not play 50 to 100 shows a year because it is making them wealthy. Erie's rock stars are, in most cases, family men with wives and children. Erie's rock stars don't live that rebellious, stick-it-to-the-Man rock star life; in some cases, Erie's rock stars are "the Man." In fact, all of these rock stars have day jobs— the very antithesis of what it means to be a rock star. Maybe we should stop calling them rock stars because these guys do what they do not because they have to, but because they abso-fraking-lutely love to do it. I sat down with non-rock stars Rob Neville and Denny Crotty of the M-80's one Thursday afternoon at Presque Isle Downs. It was about 5 in the afternoon, rainy, windy, grey, and cold, and the bar in the clubhouse was empty, save a few junketeers—some winners, some not. Unbeknownst to them, a small group of men toting cases, cables, boxes, and boards was setting up the stage for a sound check. The M-80's were to play that Friday and Saturday, bringing with them their instruments, amps, electronics, and the biggest light show of anybody in town. Setup can take up to four hours. We sat at a small table overlooking the horse track, right next to the ever-growing stage. The M-80's have been bringing their explosive brand of 1980s cover tunes to local and regional bars for almost five years, and as anyone who has seen these guys can attest, their shows can be intense—and not just due to the blazing array of pulsating light. "We probably play more songs than the average band," says lead guitarist Rob. "An average set is about 18 songs…we probably play close to 50 songs a night." These sets can last upwards of 70 minutes, and are usually perforated by a 15- or 20-minute break. Rhythm guitarist Denny adds "…we came to play. They pay us good money, so we can't be playing for an hour and taking a 45 minute break." This rapid-fire delivery of literally dozens of songs a night paces their high-energy audience through songs they already know, and still love, after all these years. The music and the lights will certainly get your attention, but let's not forget their appearance. "We dress up, like in '80s clothes, parachute pants, bandannas, the whole nine yards. I look a lot different there than I do at my day job. I own a company that sells steel," says Rob. You mean you can't wear your parachute pants and bandannas to your job? "I own an insurance agency," offers Denny. I'm going to assume you can't either. Tito, the lead singer, works at the courthouse in the office of the Clerk of Records; parachute pants with zippers would make getting through those metal detectors difficult on a daily basis. "Wild" Bill, the keyboard player, is a detective with Millcreek Township, one Dave is an underwriter at Erie Insurance, and the other Dave works in sales at Off Road Express; I assume all are parachute pants-free places of work, even on casual Fridays. Bandannas are probably out of the question as well if they want to keep their day jobs—day jobs that allow them continue their night jobs. Most musicians who are not Michael Jackson have, at one point or another, had to hold a day job. Madonna was a ray of light at Dunkin' Doughnuts. Jimi Hendrix saw the first rays of the new rising sun as a paratrooper in the U.S. Army. Gwen Stefani was a Dairy Queen before becoming a pop queen. Macy Gray had to do something, so she worked at Burger King, as did fellow royal Queen Latifah. Jack White put white stripes on furniture as an upholsterer before he ever put them on stage. Jennifer Hudson was a dream girl at McDonald's. Garth Brooks, blame it all on his roots, he sold lots of boots to friends in low places. Marilyn Manson wrote music articles for all the beautiful people in south Florida, and Kurt Cobain was a janitor, where everything presumably did not smell like teen spirit. All went on to the heights of superstardom; some even teetered and fell from those precipitous heights, but the ones who survived now sleep each night on enormous piles of gold and jewels. And the M-80's? "The honest truth is, the amount of re-investing that gets put back into the band, we probably spend more money than we actually make," says Rob. It's becoming very clear that the M-80's don't perform into the wee hours of the night after working a full day for the snazzy wardrobe additions or the enormous piles of gold and jewels. Perhaps, then, they do it for the groupies? "We're all married," Rob insists. And kids? How many kids between the six of you? "A whole slew of them." In this particular instance, slew means dozen, as Denny rattles off each band member and the amount of children they own. Although, as any parent knows, you don't own children; they own you. So, here we have wives, kids, day jobs with unrealistically restrictive dress codes, no enormous piles of gold and jewels… Could it get any worse? "You get six guys together every weekend…" laughs Denny, knowingly. Rob interrupts, also laughing. "We get sick of each other. Even just the organization of it, trying to keep it all rolling smoothly without the stress, that becomes a problem. But in reality, most of it's pretty darn good." Again, here we have wives, kids, day jobs with unrealistically restrictive dress codes, no enormous piles of gold and jewels, occasionally getting sick of your friends while managing what amounts to a small business…It's enough to drive a man to drink. So what drives these guys? Denny looks forward to shows after his day job. "I can't wait to get out of work," he says. "Going to work, that's the real grind – going to work and making a real living. This is like a release for us." Rob's take is slightly different. "In essence…I always wanted to do this, and have fun playing, and we got lucky enough to be successful on a very small scale," says Rob. "We've made a lot of good friends doing this, there are a lot of nice people we've met that we would have never met before, and that's kind of a cool thing." As I left the M-80's to their sound check, I noticed the same junketeers in the same seats at the same bar served by the same disinterested bartender. As I overheard her telling a customer about the couple that won $35,000 and then tipped her $2 on a $150 tab, she didn't seem to be enjoying her day job very much on that cold and rainy Thursday. Most working folk never for a moment get to do something that makes them happy- they simply do whatever they have to do to keep the wolves from the door; I wonder if she has a cool night job, whatever it may be- something she loves to do, something that that makes people happy, and more importantly, something that makes her happy, something that doesn't bring fame, or fortune, or anything that goes with it…Something like Rob and Denny and Tito and Daves one and two and "Wild" Bill have. "I just go by Tito, I'm kind of like Madonna." Well, we're off to an interesting start. Sitting in Sherlock's later that night, sipping on a Bud Light, was aforementioned Tito. He, along with similarly nicknamed band mates Swan, Buster, Tuna Can, and Uncle Dave make up Money Shot, who you may not have heard of if you're still living in that flooded underground cave. And, if you're keeping score, that makes two Titos and three Daves so far. Tito was not playing that night, apparently taking a rare night off. As we sat in the bar, beneath massive brick archways that had seen a thousand bands before, one more, Superbasket, was warming up for their evening performance. Plugging things in, turning things on, a few notes here and there, distortion hung thick in the air as I tried to familiarize myself with the phenomenon known as Money Shot. Billed as Erie's most versatile party band, Money Shot's well-endowed set list spreads wide open, from the 1960s to the 1980s, but they have been known to take the road less travelled and inject contemporary music from time to time as well, just to spice things up. These guys arouse the crowd into a hot, sweaty, liquor-lubricated mess, as the band easily slides back and forth from pounding, up-tempo dance-oriented sets to slow-and-steady, gently laid-back action, each time delivering a hot load of happiness to their fans' faces. "A slow month for us usually would be seven shows," Tito says. "In the summer sometimes we'll have 15 shows a month. We played 14 in March." Like the M-80's, every member of Money Shot has a day job. After working that day job, many of us are content to simply collapse, spent, in a heap on a couch in front of a glowing rectangle of some sort. Not these guys. Playing a show every other day can be grueling, but they somehow summon the stamina to keep on pounding away, performing almost every other day. Swan works at Brewerie, in the kitchen. Tuna works at the water department. Buster works at Lord Corporation. Uncle Dave has a new job. Tito can't recall exactly what it is, but that's not really the point. All of these guys have responsibilities outside the band, yet they continue pumping out music several nights a week. "I work for a catering company. It's nothing glamorous," he says. "If you've ever eaten food at a wedding or a function at Union Station, chances are I cooked your food." So, is it a grind? To go from working to working at music? "It's not easy, and that's the thing," Tito explains. "At its hardest point, on those days where you wake up, go to your job, go to a gig, go to another gig, and you have to remind yourself, you're getting paid to party…there are times when you're up there, you're exhausted, and you have to pretend like you're happy, but even at its worst moment, you're lucky to do it." Getting paid to party. Good work if you can get it, but it apparently doesn't pay enough to turn their night jobs into their only jobs, which I'm sure they would love. But who among us has a job they truly love? In an entertainment-saturated Western culture that led many of us to believe that we'd grow up to be wealthy professional basketball player rock star astronaut ninja assassins who live in mountaintop compounds with a pet monkey to fetch us beers and bacon from the fridge, it is crushing to eventually learn that this is most likely not in the cards for us. So we do what we have to do. We become cooks. Bartenders. Insurance salesmen. Writers. Not that there aren't people who aspire to these noble trades, which are all necessary and vital positions in our society, but let's face it– no matter what job you have, usually it seems like you don't hold a job, it is the job that holds you. Money Shot, like the M-80's, has an out, a respite, a relief of sorts that most of us do not have. I'm still wondering about our bartender at the casino earlier that day. The members of Money Shot are younger than those in the M-80's, and as one might expect, there are fewer marriages and fewer children amongst Money Shot. Only Tuna is married, and there are only two kids between the five members. "That we know of," says Tito. One thing that Hollywood has taught us is that being in a band can be a strain on a marriage or relationship. In this case, Erie is no different. Does your schedule affect your personal relationships? "Even being in a band makes it hard…I've run into problems in the past when I've been in a relationship," he explains. "You just get the drunken attention, and in a relationship that causes problems. I wasn't doing anything wrong, you know, but when some girl jumps up on stage and grabs your junk, it tends to upset your significant other. I generally try not to be in a committed relationship." This is all starting to sound familiar. Relationships, wives, kids, day jobs, distinct lack of gold and jewels…And playing the same songs, night after night, year after year has to get old on some level. There must be something else that drives these guys, like making themselves happy, and making others happy. Tito elaborates. "If hearing 'Jesse's Girl'for the one-millionth time is going to make you forget your troubles at work, and we have some small part in that, then that's great. We're doing our job. We'll bring people up to jam on a song and play guitar or sing and you just see this light in their eye, and they love it. You tend to take it for granted because you do it so much, but those are great moments…it kind of reminds you, you're lucky to be up there. " Although playing "Jesse's Girl" for the one-millionth time would probably drive many people insane, making others happy clearly makes Tito happy, and Money Shot will do whatever it takes to accomplish that. And since neither Money Shot nor the M-80's perform many originals—if any—Money Shot will occasionally work in covers from one of Tito's favorite bands, the Beatles. "It's like, I've been playing this stuff all night for you, now I'm going to play this one for me," he says. And the best part of being in the band? "I don't want to sound corny or anything, but I think, honestly, the thing that I love about being in a band, more than anything else…we have an air guitar player who comes to a lot of the shows, he's the coolest, like a little brother almost. Nothing makes me go to sleep better than a night where I can look at this kid who may have a really tough life, and at least for that night, because we're in a band, some of these people would rip on that kid, but on that night, they're looking at him on stage and they're cheering him on, and he gets to be a rock star for the night," he says. "Honestly, there's nothing that drives me more than that. I wish we could be bigger, and better, just for that. I'm not in this to pretend to be a rock star. I'm a guy in a cover band in Erie, Pennsylvania. That's what I am. I feel like I'm good at what I do, but that's it. I'm not trying to play dress-up, or be Mr. Rock Star Guy. But when somebody like these guys feels like a rock star- that makes me feel good. " The common thread between these bands is that they do what they do because it makes them happy, and makes others happy. Despite the complications, the relationships, the wives, the kids, the day jobs, the parachute pants prohibitions, the distinct lack of gold and jewels that plague us all…The guys in the M-80's and Money Shot—and, I suspect, every other band in Erie—still have that escape to look forward to at the end of each workday, and there's no day job in the world that could ever change that. Next time I see that bartender at the casino, I'll be sure to ask her if she can sing. The comedy legend makes his first Erie appearance. Pro Wrestling: Alive and well in Erie, Pa.
Local organization Pro Wrestling Rampage celebrates its 7th anniversary. Local poets, dancers, artists, and musicians collaborate to make this fundraiser a one-of-its-kind.